Remember the old cartoon, The Jetstons? Well, I've been wondering for a while about George's wife, Jane. What exactly did she do? Near as I can remember, all she did was complain and spend her husbands hard earned money. 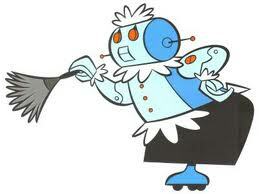 They had that maid, Rosey the robot. She did all the cleaning and tending of the kids. She even made dinner by zapping it out of that space-age dinner vending machine. 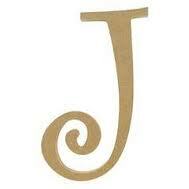 So I'm left wondering, was Jane a realistic sampling of life in the 60's when this first came out? In the 80's when it ran for a few more seasons? What about today? I didn't watch the series very closely, so I'm hard put to understand its characters. No work; spending obey. Hmmmm. LOL, cartoons are full of weird little mysteries like this! Yeah. But as kids, they mostly go over our heads--until we grow up and start questioning. I loved it too! I watched it all the time. Astro was my favorite. I don't know think about Don Draper's first wife on Mad Men - what did she do? Riding lessons and looking beautiful. Same era. I love the dinner vending machines though. I haven't seen Mad Men, but I agree, the dinner vending machine is a must-have! I think she worked as a secret agent for spacely's sprockets. They couldn't show it because it was so top secret. Good call! She probably was a spy. That would explain a lot! Haha, great minds think alike. Hello fellow Jetsons fan :) I gotta wonder the same thing. Jane always seemed a little vacant to me, but hey, who am I to judge a space wife. Great show regardless. I guess they had to have a mom, whether or not she was vacant. And it was a kids show, so I can't be too picky. You are totally hitting the hard topics. I love it. 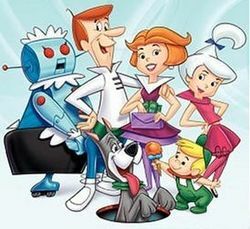 It's crazy in all the years I watched the Jetsons, I never really thought about this. Disturbing really, how unaware I am. What DID she do? Then again, with a house full of boys, even with a maid, I'm sure she was busy. I mean, seriously, have you seen the chaos???? Boys can wreak havoc on anything! I think this was made back before the days when parents were encouraged to watch with their children and talk about what they were viewing. PS-meant to mention, LOVE the blog. This is fun! I never really thought about it, but I used to love her. I'm still waiting for the little conveyor belt thing to get me ready in the day. 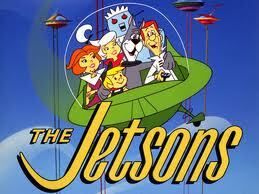 Shouldn't our technology today have caught up with the Jetson's? Haha! 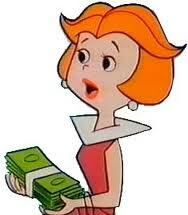 I love that Jane Jetson came to mind when you thought of J! I haven't thought of that show in SO LONG. And I totally want Rosie to live at my house. We could all use a Rosie at our house. That's where they should be putting the American budget. Forget every family in a home--every home with a robot maid! I wish I had a Rosey the robot! I'll get her for you for your birthday. Then we can go to JCW's and celebrate! She stood there looking beautiful for a kiss when George got home from work, she did her hair and put on make up every single day. She is also a mother. What more can you expect? Well then, she accomplished her tasks better than me! I mean the make-up and looking beautiful everyday thing.